"I love the brace. It provides support for my back. I would be willing to test any technology or equipment your company has. Thanks!" "I have been a practicing chiropractor for 18 years. Patients are loving the lumbar decompression belts. We just started selling them and have sold 2 dozen already. All of the feedback has been positive and they are really helping people. Many patients will wear them under garments and you don't even see that they are using them. It is a great product and my patients have benefited from them." How should the DDS Decompression Back Brace be positioned on my body? The DDS Decompression Back Brace should be positioned so that the Disc Disease SOLUTIONS patch is centered and lined up with your navel. The bottom portion of the DDS Decompression Back Brace should rest above the upper part of the hip bones and the upper edge of the DDS Decompression Back Brace should rest below the lowest part of the ribs. 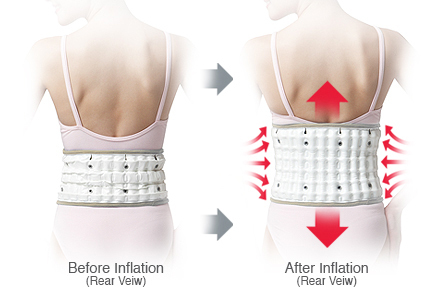 As the DDS Decompression Back Brace is inflated, the lower edge expands downward to anchor itself against the upper part of the hip bones and the upper edge expands upwards to anchor itself against the lower portion of the ribs. Once this anchoring occurs, further expansion of the DDS Decompression Back Brace results in positive traction to the lumbar spine. My DDS Decompression Back Brace won’t stay inflated. What do I do? First, close the valve on the DDS Decompression Back Brace all the way by rotating it clockwise. With the valve in the closed position, attach the air pump and inflate to the desired pressure. Disconnect the air pump. If the DDS Decompression Back Brace is still not holding air then contact Disc Disease Solutions, Inc. regarding warranty information. If you gain several pounds, DDS offers an extension piece that can add up to 8 inches to the length of the belt. If you lose several pounds you may need to buy a smaller DDS Decompression Back Brace in order for it to fit properly. I’ve been wearing my DDS Decompression Back Brace for awhile now and its working great, however, it is getting dirty. Can I wash it? Yes. The DDS Decompression Back Brace can be washed in the washing machine by placing the DDS Decompression Back Brace into the mesh bag that is provided and washed on the “gentle” cycle with a mild detergent and warm water. Make sure that the air valve is tightly closed before placing the DDS Decompression Back Brace in the washing machine. Water must not enter the belt. After completing the wash cycle, the DDS Decompression Back Brace should be air-dried in the shade (keep away from direct sunlight). What is the difference between the DDS 500 and some of the other products made by other companies that look similar? Our DDS 500 Lumbar Traction Brace has 4 US approved utility and design patents and we are the original inventors. Other products that appear to be similar to ours are most likely fake copies made of inferior materials. Disc Disease Solution Braces are made with a 100% cotton lining with very durable materials. We stand by the quality of our products and provide a full 1-year warranty from the day the patient receives the brace. Other companies use questionable material and some only provide a 30-day warranty. DDS Traction Braces are ergonomically shaped to the curvature of the lumbar spine allowing for a higher degree of decompression. The efficacy of our Research and Design is proven in clinical studies. Please take a look at our section dedicated to studies and testimonials from medical professionals. We urge you to compare them with other brands. Our portable Hand Air Pump is lightweight and can be stored in a small bag or purse providing easy transport. Our pumps also have a gauge so one can see exactly how much pressure there is in the brace at all times. Other pumps do not have a gauge and are much bulkier. Some are even applied by using your foot. Our products are machine washable. We promote a very healthy and active lifestyle. At the very least, we want you to live your normal life and perspiration is inevitable. Every brace comes with a laundry bag for you to put your brace in to machine wash. Other companies will explicitly tell you to never put their belt in water which may lead to unsanitary conditions. We have a full line of products that use our Vertical Air Pressure Technology; we’re not a one-dimensional, one product company looking for a fast dollar. This is something we’ve been committed to for a very long time and we plan on continuing to help those with neck and back problems by constantly striving to improve our products and services.